Life Coaching has come a long way as a profession over the past decade. Thanks to the work and dedication of Certified Professional Coaches all over the globe, a profession that was once not well known by the general public is now widely recognized by individuals and corporations. So what exactly is Life Coaching? Coaching can be described as a relationship between a Life Coach and client where the coach uses specific skills to help the client achieve agreed upon results. The profession is led by the International Coach Federation, which coaches can join for professional standards, support, knowledge and other tools to support their practice. The ICF sets the standards for schools and has a set of steps by which schools become Accredited Coach Training Programs (ACTPs) or Approved Coaching Specific Training Hours (ACSTHs). While it is not mandated that you become certified to work as a Life Coach, it can be compared to being a massage therapist in the 1970’s or 80’s- anyone could hang out a sign and call themselves a massage therapist. Today, it is safe to say that not many people would consider going to a non-licensed massage therapist. The same thing has happened in the coaching field. Getting certified through an ICF Accredited Coach Training Program (ACTP) provides you with a solid foundation of skills and standards on which to build your profession and career as a Certified Life Coach. By providing standards and independent verification, the ICF has created a network of certified coaches. As a practicing Certified Life Coach, this provides you with many tools for your Life Coaching business and most importantly- credibility with your clients and within the coaching community. So what does it take to become a Certified Life Coach by an ICF accredited program? We have defined it in three steps. Currently, there are over 800 ICF accredited programs offered all around the world. The ICF Accreditation guidelines are global, as there are not state or region-specific guidelines or standards for coaching. At National Coach Academy, we are proud to recommend Coach Training Alliance as our top life coach certification program. 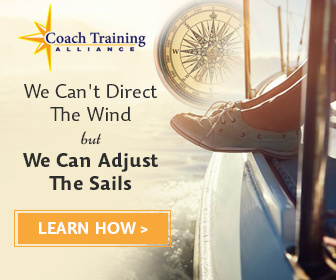 While a lot of coach training programs emphasize the academics of coaching, CTA is uniquely focused on preparing you for the real world challenges of running a coaching business. Unlike many programs that simply provide business resources for you to take advantage of, CTA’s business training is interwoven in their core curriculum, guiding you every step of the way on your journey to developing a meaningful, and profitable, coaching business. This unique emphasis on the business side of coaching is what sets CTA apart from most other programs we’ve encountered. Best of all, it’s one of the most affordable certification programs on the market (and certainly the most affordable program mentioned in this article). Remember you can search by location, distance learning options, language or coaching specialty at www.coachfederation.org. Some programs are offered in a traditional face-to-face setting with no options for distance learning. This is ideal for some coach trainees if there is an accessible location and a desire for more personal contact with trainers and fellow coaches. You will want to consider the location of these programs in relation to your current residence. Are they near enough for you to remain at home while completing, or would you have to travel? If so, will the logistics of traveling (cost, ease of accessibility and time) work within your current situation? You will also need to consider travel costs in addition to tuition costs, which we will cover later. In my experience, people who want to complete their training face to face prefer this environment versus working more independently. While both types of learning can promote and foster relationships between coaches, the traditional may offer more opportunities for this type of interpersonal and social growth. Some people prefer to do the entire program face to face, while others prefer a distance learning component. The benefits of completing part of your program through distance learning channels (phone, video conferencing and internet) include convenience (time and travel) and cost. The percentage of program time spent on distance learning varies by program. You can search for programs with a distance learning option at the ICF website (www.coachfederation.com). At the time of this writing, twenty ICF Accredited Coach Training Programs can be completed exclusively by distance learning (and plenty of ACSTH programs like Coach Training Alliance can be, as well). If you have work or personal responsibilities that make it more difficult for you to participate in a traditional program or mixed delivery program, this option may work best for you. Since a large percentage of coaches work the clients only by phone or video conferencing in their practices, this option does work well for many people completing a Life Coach Certification. The cost and convenience for these trainees outweigh the benefits of working and learning in a face-to-face environment. Based on the delivery mode of the training, program length varies from program to program. To meet all of the mandates of the ICF, each program is required to include all of the prior listed components. Therefore, the mode of delivery can affect the length of the program. Programs can range in completion time to under a year to several years based on the program and the pace of the student. If you are under a specific time frame for your certification, this will be one of the first things to look for in the schools you research. Once you have eliminated the programs that won’t work based on length, location or distance learning options, you can start looking at the programs that will work and what they have to offer. Each Life Coach Certification program is unique, not just in its delivery, but its philosophy as well. For example, one program might be geared more toward executives and corporations while another might be focused on non-profit or spiritual work. Make sure you are comparing apples to apples. 1. What is included in the listed tuition cost? Are all of the hours/modules included in the price, or are they priced separately. What is the total cost for all of the modules I will need to receive my Life Coach Certification? 2. Will I be expected to pay for a coach or mentor coach outside of the tuition amount? 3. What books, supplies, materials, etc, will I be expected to have/purchase during the course of the training? 4. What travel and incidental costs will I have throughout the program? These may include travel costs (e.g. gasoline, flight purchase, hotel, food, incidentals), office/technology administration (e.g. long distance, cellular, internet service fees) or other miscellaneous expenses. For example, I attended the Institute for Professional Excellence in Coaching (iPEC) in 2003-2004. At the time, all of the costs in items 1-3 listed above were included in the listed tuition. I also incurred travel and incidental costs by traveling to NYC for training. Make sure you fully understand upfront what your total estimated costs will be so that you can make an informed decision that works for you and your finances. By now, if you completed Step 1 and narrowed your choices down by location, mode of delivery, philosophy, areas of specialization and cost, you should be ready for Step 2. At this point, it is important to take action and make contact with the programs on your short list. This step is important as it can give you invaluable information about the program that you were not able to find online. Speaking with coach trainers and past graduates of the program gives you another perspective of the program and hopefully, even more details than the website is able to convey. You may find after this step that the program you thought was right for you was not the perfect fit after all or you may find that you hit the target perfectly. While this step isn’t absolutely required, I consider it critical as additional insurance that you will be happy with the investment you make in your life coaching certification. In addition to the questions you may already have listed for the program representative, here are a few additional that you might consider. 1. What did you like best about the program? Least? 2. Would you recommend this program? Why or Why Not? 3. What are some examples of how your graduates are using their certification? 4. How much interaction exists between trainees and coaches during the program? Where can I find support if I need it? 5. How much support is available to Certified Coaches after they complete the program? Compare your findings and experience against your wants and needs for a Life Coach Certification Program and choose the best fit for you. These are the skills that you learn to use as a coach. Coaches have countless skills and tools in their skill set to use with clients. Many of these are based in advanced communication techniques. 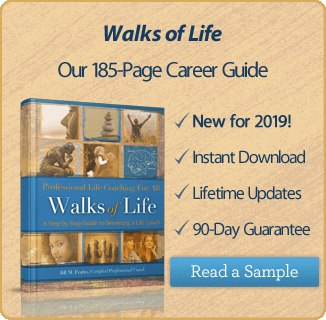 An ICF Certified Life Coach uses these skills to move their clients forward and help them reach the goals that they have for the coaching relationship. As the leader in defining the coaching profession, the ICF has created a code of ethical standards that accredited programs commit to uphold. Your training will cover the code in depth so that you have a complete understanding on which to base your profession. While it sounds daunting to be observed by an experienced coach, it is extremely helpful and empowering as you learn from their observations and guidance. The format may be via conference call, video or in person depending on the school you choose. The purpose of the final exam is to evaluate your competency as a coach. The exam is a combination of written and verbal components based on each individual program. Once you successfully pass this exam, you have completed all requirements to become a Certified Life Coach. Many coaches describe the process of getting certified as enjoyable and also very enlightening. As you complete the requirements to become a Certified Life Coach, you also spend significant time working on your own personal and professional development. This makes you a stronger and more skilled coach and leads to your greater success with your own clients. Now that you are certified, it’s time to go out and get clients! Previous post: What is a Life Coach? Next post: What Does a Life Coach Do?